This new picture created from images from telescopes on the ground and in space tells the story of the hunt for an elusive missing object hidden amid a complex tangle of gaseous filaments in one of our nearest neighboring galaxies, the Small Magellanic Cloud. The reddish background image comes from the NASA/ESA Hubble Space Telescope and reveals the wisps of gas forming the supernova remnant 1E 0102.2-7219 in green. The red ring with a dark center is from the MUSE instrument on ESO's Very Large Telescope and the blue and purple images are from the NASA Chandra X-Ray Observatory. 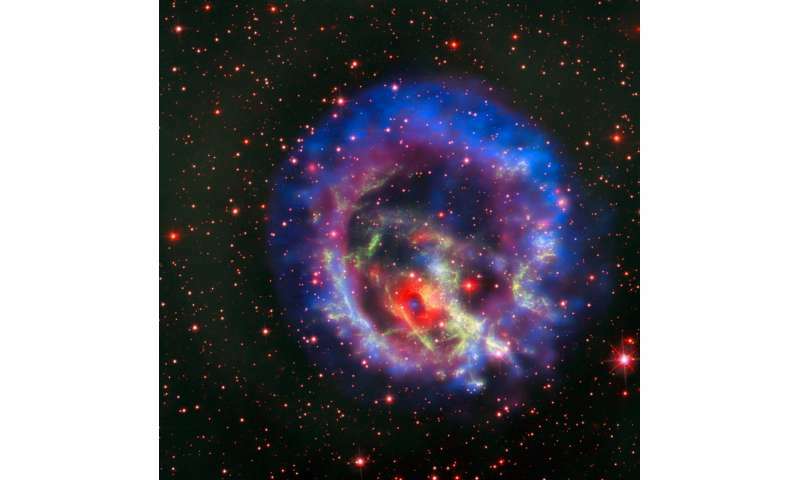 The blue spot at the center of the red ring is an isolated neutron star with a weak magnetic field, the first identified outside the Milky Way. Credit: ESO/NASA, ESA and the Hubble Heritage Team (STScI/AURA)/F. Vogt et al. New images from ESO's Very Large Telescope and other telescopes reveal a rich landscape of stars and glowing clouds of gas in one of our closest neighboring galaxies, the Small Magellanic Cloud. The pictures have allowed astronomers to identify an elusive stellar corpse left behind by a 2,000-year-old supernova explosion. The MUSE instrument was used to establish where this object is hiding, and Chandra X-ray Observatory data confirmed its identity as an isolated neutron star. The team noticed that the ring was centred on an X-ray source that had been noted years before and designated p1. The nature of this source had remained a mystery. In particular, it was not clear whether p1 actually lies inside the remnant or behind it. It was only when the ring of gas—which includes both neon and oxygen—was observed with MUSE that the science team noticed it perfectly circled p1. The coincidence was too great, and they realised that p1 must lie within the supernova remnant itself. Once p1's location was known, the team used existing X-ray observations of this target from the [Chandra X-ray Observatory] to determine that it must be an isolated neutron star, with a low magnetic field. When massive stars explode as supernovae, they leave behind a curdled web of hot gas and dust, known as a supernova remnant. These turbulent structures are key to the redistribution of the heavier elements—which are cooked up by massive stars as they live and die—into the interstellar medium, where they eventually form new stars and planets. ......and what happens to the now positively charged material once it has electrons stripped? Does it no longer have any influence? Is positively charged matter unable to regain the lost electron? .....and what happens to the now positively charged material once it has electrons stripped? Does it no longer have any influence? Is positively charged matter unable to regain the lost electron? When negatively charged electrons have been stripped from their orbital shells & positively charged protons stripped from the nucleus to create these vaunted NEUTRON STARS, the net remaining charge is zero. That's right, neutrons are not positively charged as you are suggesting in making this statement that: "positively charged matter unable to regain the lost electron?" Care to retract your statement? Or will you take the usual tact & double down on your ERROR? Reading isn't your strong point, is it? Your buddy Urine33 only mentioned electrons as the reason for magnetic field magnification. He specifically spoke to the stripping of electrons from atoms, and last I checked, it is pretty common for an atom to have both protons and electrons. So, if an atom is stripped of an electron, the remaining atom is now net positive if it was previously neutral. Since your buddy Urine33 was literally never mentioned any atoms or material being pulled into the neutron star, only being trapped in orbit, that means the now positively charged atom remnant is also in orbit, apparently unaffected by the cloud of free electrons. Learn to read, Benni. Astronomers look at what they can see locally in detail for clues about how celestial energogravitomechanics work. These are the basic principals that should be applicable elsewhere. I take it low magnetic fields mean weak rotation of the core remnant, or greater neutron homogenicity of that remnant. Although a neutron star with very high point source gravity, it may have remnant heat to warm the surface for a long time. One wonders when a combination of agglutination of local debris from the original nova that moved 'too slow', and encountered interstellar matter along its trajectory would add up to a stack on a surface eventually below boiling temperature of water at Earth MSL...... then could even support some kind of really hardy almost two dimensional life. Almost hate to mention this 'cuz some wacko will say that this is 'where superman came from'.